The Oakland Athletics have signed starter Marco Estrada to a one-year deal, the team announced Friday. The deal is for $4 million, according to ESPN's Jeff Passan. Estrada spent the last four seasons with the Toronto Blue Jays, pitching to a 4.25 earned run average during his tenure north of the border. He posted a 5.64 ERA last year but was limited to 28 starts and 143.2 innings because of back trouble. He had a combined ERA of 3.88 in the three seasons before. Estrada was named to the All-Star Team in 2016 but did not pitch because of a back injury. 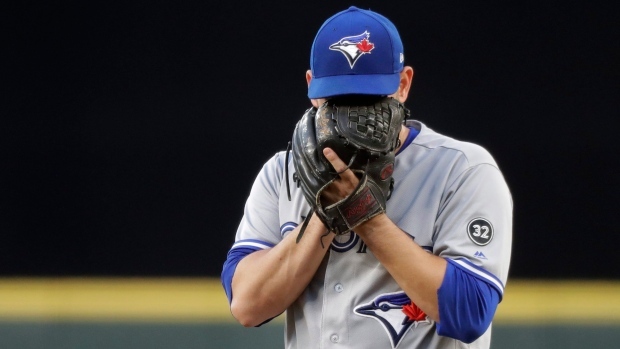 Estrada might be best remembered for his performance in Game 5 of the 2015 ALCS against the Kansas City Royals, allowing one run on three hits over 7.2 innings as the Jays went on to win 7-1. Though Kansas City went on to advance (and win) the World Series, Estrada remembers it as one of the best moments of his career. “I've never been part of anything like that," Estrada told the Sporting News last September. Estrada originally joined the Jays after spending five seasons in Milwaukee with the Brewers. He arrived in Toronto via trade in exchange for first baseman Adam Lind. Before that, Estrada made his debut with the Washington Nationals in August of 2008. He is 62-66 with an ERA of 4.24 over the course of his 12-year career.